This is the soundtrack of the game I didnt even knew I wanted to exist. From the first track on, these sounds pull you into another dimension full of undiscovered dangerous worlds, hidden secrets, adventuresomeness and love. Its rare that a record makes you want to reach for the stars, or at least for something that puts you into the shoes of an adventurer among the stars. An Electronica record that uses subtle, yet very powerful rhythms together with driving beats and some elements that remind me a bit of house at times (who can resist a french touch after all) to form an engaging sound voyage for the listener. The whole record just feels incredibly polished and rounded, touching several emotional states and sharing stories. Taking into account how vividly these tracks put corresponding images into my mind, its hard to see this just as a music album, and not as a part of a bigger picture. If there is anything bad I can say about this record, its that I want the corresponding game, book or movie and I want it NOW. 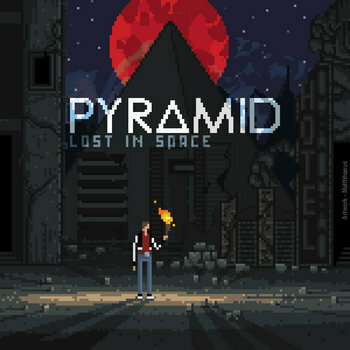 Considering the quality and craftmanship to make this music style fit so many different occasions in a setting so seemingly easy, its pretty impossible to pick any favourite tracks, therefore I highly recommend taking the full trip with Pyramid, gazing into the stars and completely losing yourself in space.